Here is a conversation tip to help you nurture emotionally healthy children within your children’s ministry or Christian home. It’s important to encourage your children to express their feelings. Feelings are a gift from God. Children should be allowed to communicate everything from love to hate in a safe and appropriate way. As Christian teachers and parents, we have the awesome responsibility of nurturing emotionally healthy children. Whether you are in a classroom or your living room, you need to present your children with safe and appropriate ways for them to express and feel their emotions. Sadly, many people assume that childhood is one big party. People look at children and see them playing and having fun with friends and think, “What more could they want? Their life is easy!” But children are people, too. People with good days and bad days. People who are learning to navigate through life’s emotional mazes just like adults. We do our children great disservice when we don’t engage with them emotionally. We do them disservice when we don’t take the time to engage in conversations to help them through the different feelings they are dealing with. Today, I want to give you a conversation tip to help you nurture emotionally healthy children within your children’s ministry or Christian home. God wants us to communicate with Him and each other. Communication often happens between friends. Friendship is one of the greatest gifts God has given us and children LOVE being around their friends. Friends can experience lots of different emotions such as love, jealousy, happiness and anger. When you provide friendships for your children within your neighborhood or classroom, you will provide ample opportunities for them to come face to face with lots of feelings. Here’s an example of a conversation about a more passionate emotion such as anger. Let’s say you see a child, named Zach, in your classroom grab all the crayons from another friend, named Eli. Eli starts to cry and pushes Zach and yells, “Give me back my crayons.” First of all, as the teacher, you need to separate the two boys and deescalate the situation. You should make Zach give back the crayons and ask him to apologize for taking what did not belong to him. You should also have Eli apologize for pushing Zach. Then, when a little time has passed and you have the opportunity, take each of the boys aside separately and have a conversation with each of them about what they felt in the situation. The next thing you might ask is, “Did you push Zach because you were mad at him?” Hopefully, Eli will begin to associate his response with his feeling and say, “Yes, I pushed him because he made me mad.” At this point, you can teach Eli that his response was wrong and give him some alternative choices he could have made, such as coming to you to help solve the problem or asking Zach to share the crayons. These conversations don’t have to last long. Make it simple and be consistent with this kind of communication so that your children recognize you to be a safe person with whom they can express their feelings. The more you teach your children to express their feelings in a safe and appropriate way, the more you will have emotionally healthy children. 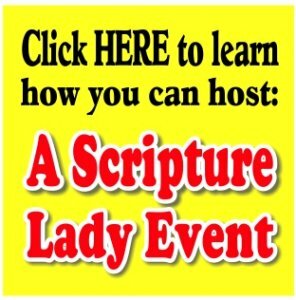 Want more encouraging thoughts for your children’s ministry from The Scripture Lady? 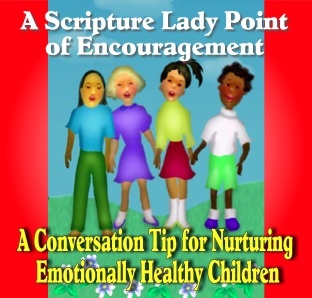 If you liked this children’s ministry idea about nurturing emotionally healthy children, then sign up to receive Scripture Lady’s Free Email Kid Tips packed full with creative ideas and receive 12 FREE Bible downloadable resources to help get the kids you minister to excited about the Bible! Just go to www.MyFreeBibleGames.com to fully subscribe.